For the Love of Chocolate Foundation awards scholarships 2016 to students in full-time programs at non-profit colleges, promoting commitment in pastry arts education for individuals looking to change careers, as well as individuals who have shown potential in the culinary field but have no formal pastry education. The goal of the scholarships is to encourage and assist aspiring students, career changers, and culinary career professionals to advance their knowledge of the pastry arts. The program is specifically geared toward individuals who are in need of financial assistance. Through the generosity of the foundation’s sponsors, alumni, industry vendors and associates, scholarship funding to offset tuition is available to all new students on a first-come first-served basis, through a competitive application process. Through the generosity of the foundation’s sponsors, alumni, industry vendors and associates, scholarship funding to offset tuition is available to new students on a first-come first-served basis, through a competitive application process with certain requirements (see below). The total number of scholarships granted and the amount awarded per student are at the sole discretion of the Foundation’s Board of Directors and are directly related to the funds available per semester. If an applicant withdraws from the program at any time, s/he must repay all of the awarded scholarship funds. - Applicants must demonstrate a desire to develop their pastry art skills. - Applicants must agree to work or volunteer a minimum of 40 hours in a food service establishment prior to or during the semester, and their work must be documented by a direct supervisor. - Applicants must submit the essay questions and budget. - Applicants must provide two letters of recommendation. - Applicants must demonstrate financial need. Students who will be seeking student loans or other financial aid to support their enrollment in the program must supply this information. A copy of the previous year’s tax return is required. - Applicants must submit the scholarship application form and all the supporting data by the semester deadlines: May 1st, June 1st and October 1st. - Applicants are informed of the scholarship committee’s decision in writing by May 31st, June 30th or October 31st. - Completed form, please email it back to franco@ftloc.org. The foundation’s Board of Directors shall choose five individuals to serve on the selection committee. The committee shall review each applicant and determine who is eligible, as well as who are the final recipients of the scholarships. The selection is awarded May 31st, June 30th and October 31st. * For the Love of Chocolate Foundation scholarships are awarded to U.S. citizens and/or to foreign nationals who currently hold a federally issued Permanent Resident ("green") Card and are eligible for federal financial aid. 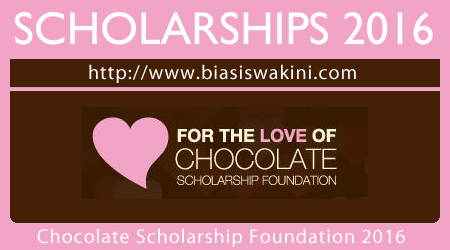 0 Komentar untuk "Chocolate Scholarship Foundation 2016"